Faraway Press: The Online Home of John Jackson Miller: My new hardcover for 2013: Star Wars: Kenobi! With the conclusion of the latest round of Star Wars: Knight Errant comics on Wednesday, people have been asking for months what I had coming next. People have also been asking, after my long association with the Expanded Universe, when I would get around to writing heroes from the movies. I thank readers for their patience. I can say, that time is now! At New York Comic-Con, Random House/Del Rey announced my next novel — and it’s big: Star Wars: Kenobi! It’s a hardcover release tentatively scheduled for late 2013. Check out the promo artwork here, by Chris Scalf! 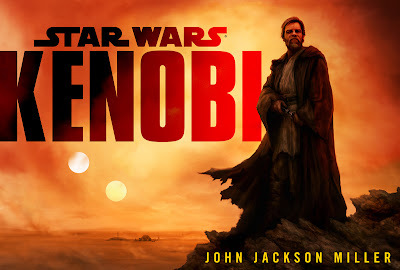 Kenobi is a sweeping story that’s part epic western, part high-stakes drama, part romance — but it’s all Star Wars, taking place in the early days of Obi-Wan’s exile to Tatooine. I shouldn’t expand too much beyond what Random House said on its panel and Facebook page, but I can say this. I’ve been working on this concept for years — I’ll talk more about that process later on — and the basics are pretty simple. The greatest hero in the galaxy faces his toughest challenge yet: He must stop being Obi-Wan — and learn to live as Ben. If you haven’t visited my website before, click the links above and around to find production notes and trivia on my other books, including the Star Wars: Knight Errant and Lost Tribe of the Sith books from Del Rey. And visit my Amazon Author page for more books. That’s it! More news as I can share it -- be sure to follow me on Facebook and Twitter. UPDATE: I have added Iowa's SF convention, I-CON, to my schedule next month, Nov. 2-4. I am really looking forward to this book. Kenobi's development was my favorite part of the PT. I'm looking forward to see John transition him from Obi-Wan to Ben. I am so very very pleased to see this, I can't wait to read it!! Thanks very much! It should be fun.